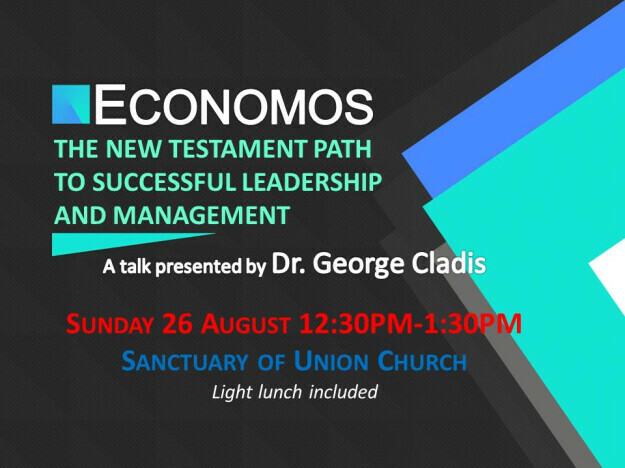 Join us for a talk: Economos: The New Testament Path to Successful Leadership and Management. Description: This forty-five minute seminar highlights the New Testament concept of the Economos as the path to successful living at home, with friends and family, and at work. (Economos is related to our English words economics and ecology.) You have read Drucker, Sandberg and Collins; now come and hear what Scripture has to contribute to modern day leadership and management at work and at home. – Dr. George Cladis, Presenter. Sign up in the foyer or contact Pastor Michele for questions.